aglow. We looked like toxic merpeople. a fondness for banishing serpents a’ la Beowulf. as I’m not. Mawes. Maudet. Maudit? a thing, a place is defined by what it isn’t. is castle Pendennis. I’m always elsewhere. In some towns, even the locals look like foreigners. in Cornwall, and saints you’ve never heard of. 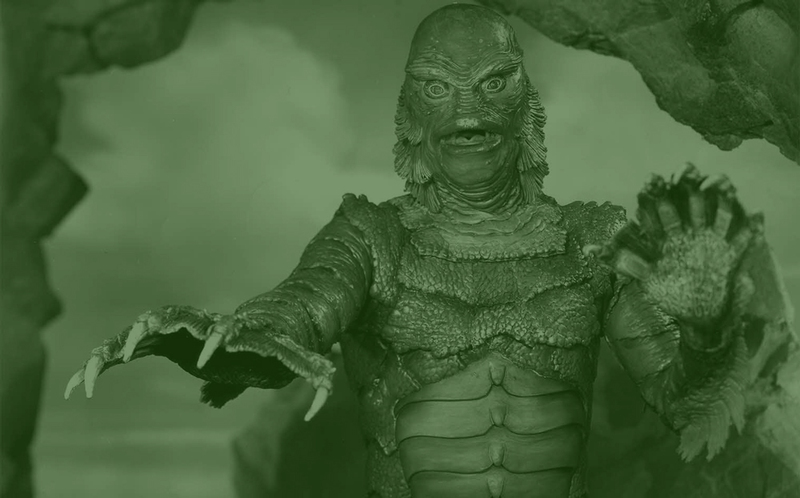 Image Credit: Creature from the Black Lagoon (1954), IMDB. Steve Lambert was born in Louisiana and grew up in Central Florida. His writing has appeared in Broad River Review, Emrys Journal. Tipton Poetry Journal, Madcap Review, Sky Island Journal, Into The Void, Spry Literary Journal, The Gambler, Deep South Magazine, Cortland Review, and many other places. He is the recipient of two Pushcart Prize nominations, one Best of the Net nomination, and was a Rash Fiction Award finalist. He won third-place in Glimmer Train Stories’ Very Short Fiction Award, and is a five-time finalist in other Glimmer Train contests. He is the author of the poetry collection Heat Seekers (2017, Cherry Grove Collections). He lives in Northeast Florida, with his wife and daughter, where he works in a library and teaches part-time at the University of North Florida.